We have setup a FAQ section for the YEGPIN with various questions that we receive from the public. Questions and answers will be posted here to provide you with some direction about the show. Q. What happens if YEGPIN hits capacity? A. Capacity for the event is 1500 people at one time in the building. We don’t expect the facility will reach these attendance figures, but if we do, we will create a line-up process in the entry way to the event. Priority will be given to YEGPIN VIP’s, followed by weekend pass holders, everyone else will be granted admission in line order as soon as people leave the event. If you leave event temporally you will need to line up again to gain access. Q. How can I pay for my silent auction items, concession items or general merchandise at the event? A. VISA/MC, Debit and Cash, there will be ATM’s at the event for your use. A. There is tons of parking, wherever there is room in the event, in the front parking area, their will be a reserved lot for volunteers, but the rest of the facility is first come first served. Parking is also available along the side street if these lots fill up. Q. How do I access my VIP passes or Weekend Pass for the event? A. YEGPIN has an electronic ticket-less process, if you are a VIP, Premium or Pre-Sale Weekend pass-holder upon entry into the event you will proceed to the VIP line. On arrival you will receive your entire show package for the weekend, lanyards, passes and any merchandise. If you are a weekend pass-holder, you will get your wristbands for the event duration. We ask that you bring ID with you so that we don’t accidentally give your package to someone who shouldn’t be getting it. Q. Can I bring outside food and drink to the event? A. No outside food or drink will be allowed into the event. Food and drink is available in the concession zone and must stay in this area. You will be asked to enjoy, bring to your car, or throw away any outside food you attempt to bring into YEGPIN. This is strictly for the preservation of machines that have been generously donated for the event. Q. Is this an all ages event? A. Absolutely, in fact children 12 or under get into the show for free (up to 2) with paid adult admission. 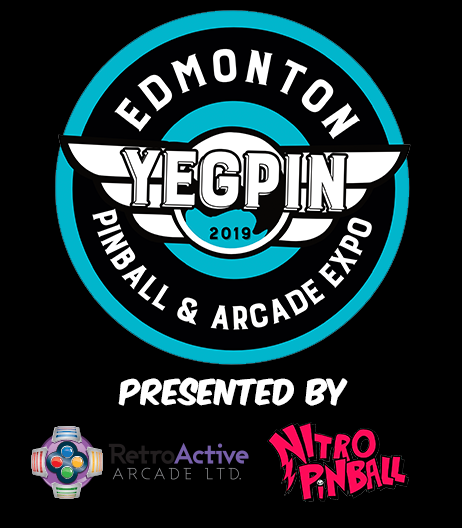 There are plenty of machines for children to play, YEGPIN is about building future generations of pinball and arcade enthusiasts. The only exception is the VIP Party, and YEGPIN After Dark. These are 18+ events.